Achieve radiant, glowing skin with an enzyme or chemical peel. At Apeel Aesthetics, we have a variety of Peel options for all skin types and concerns, from mild (Natural Enzyme) for a pre-event glow, to deeper peels for more serious skin issues. Our peels differentiate by levels of strength and healing time. Although the idea of peels sometimes makes people cringe, it is important to realize how new scientific breakthroughs have altered the way these procedures work. Our Aestheticians are also Certified Peel Specialists and will consult with you to discuss the most beneficial peel for your skin. 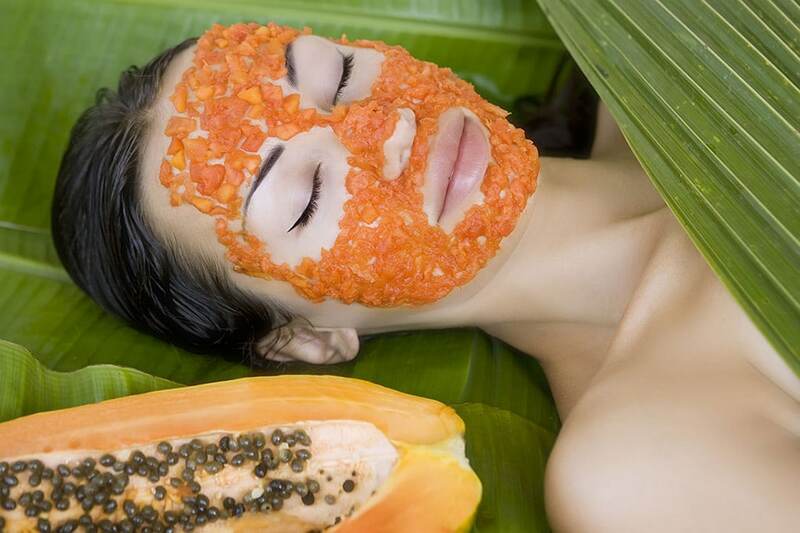 Peels rejuvenate and improve the look and feel of skin, stimulating new cells and collagen production. Improve skin elasticity. Minimize and reduce skin frustration such as age spots, acne congestion, acne scarring and dark patches (melasma). Reduce fine lines and wrinkles caused by sun damage and aging. Improve the appearance of scars or pigmentation. Improves skin clarity, tone and texture. Before beginning a peel, all of our valued clients will receive a skin analysis and consultation to discuss goals, develop a customized program that will meet your skin specific needs, downtime, safety concerns and pre- & post-care instructions. 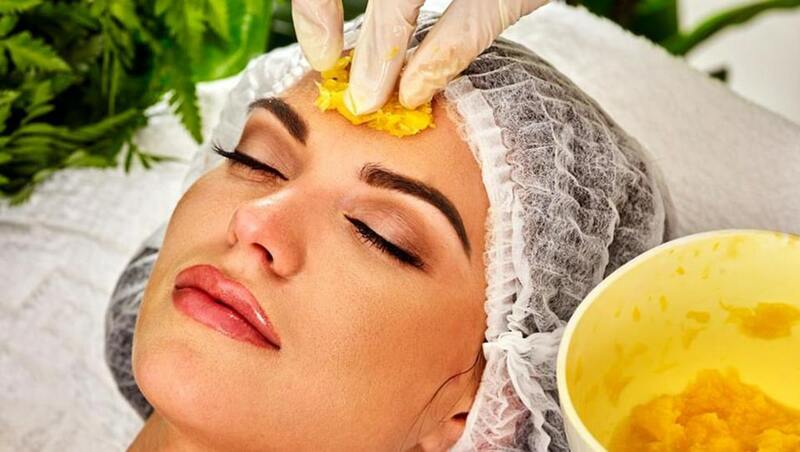 Please be open to the possibility that you may need several peels to achieve the most optimal results. If you are a first time client, we recommend you book a hydrating balancing facial. NOTE: Your skin must be properly balanced, hydrated and pre-treated before beginning your Peel Treatments. Choose to infuse your skin with our nourishing professional-grade Vitamin C skin peel that will instantly lighten, brighten and tighten, minimize discoloration, acne, sun damage, and aging! Restores a more youthful appearance. Improves clarity, color and skin texture. Leaving dull skin radiant. Noticeable improvement after just one peel. Optimal results are achieved after doing a series of treatments. Suitable for all skin types. CAUTION….your skin will immediately GLOW! Our professional grade pumpkin peel increases cellular turn over, rids dry damaged skin of dead cells by exfoliating surface cells, increases epidermal and dermal hydration, binding skin moisture. Leaves the skin rejuvenated and glowing. Successful in destroying surface bacteria & provides anti-inflammatory and antioxidant benefits. Softens the appearance of fine lines and wrinkles. You will LOVE this peel! Noticeable improvement after just one peel. Optimal results are achieved after doing a series of treatments. This wonder treatment reduces the appearance of pores and skin irregularities. Stimulates cellular turn-over and brightens skin. This high performance dual-purpose restorative peel is uniquely formulated with glycolic acid which reverses sun damage, exfoliates and retextures to reveal bright, glowing skin. Also included is a high concentration of Sodium hyaluronate (Hyaluronic acid), a powerful hydrating ingredient with the ability to attract and retain moisture. It is abundant in the dermis of younger skin, but levels decline with age and makes skin appear older. Sodium hyaluronate helps restore youthful fullness, gives skin volume resulting in smoother softer skin with decreased wrinkles and an all-around more youthful appearance. In addition, this treatment is infused with anti-inflammatory botanicals, antioxidants and is brimming with Phytonutrients including Purple Sweet Potato Root extract that nourishes new skin cells. Revealing radiant and vibrant skin. Naturally scented with rose petals to stimulate the senses and relax your spirit. Now that’s the icing on the face! Take your skin to paradise with a Fusion of Passion Fruit, Papaya, Pineapple, Mango, and Polypeptides. Sometimes all the skin needs is a little boost of rejuvenation, without visible peeling. This non chemical peel re-balances, regenerates and restores skin while comfrey plant stem cells recharge your skin’s stem cells helping to maintain youthfulness of skin. Great for anyone with sensitive skin or anyone who wants to look and feel refreshed and rejuvenated. Healthy skin and a glowing complexion is just a peel away without the down time. Suitable for all skin types. If you are new to “chemical peels,” or have very sensitive, unbalanced or irritated skin, you will absolutely LOVE this peel. See visible dramatic results even from the first treatment, this 33% Glycolic Peel is infused with anti-oxidants and anti-inflammatory properties. Glycolic acid is the most widely used peel and can be used on most skin types. By rapidly exfoliating epidermal cells, it instantly unclogs pores, congestion, smoothes texture and clarifies the complexion. Targeted for sluggish, unevenly textured or acne prone skin. Dissolves Pore-clogging Debris; Smoothes Fine Lines and Wrinkles; Reduces Superficial Scars; Refines Texture. Restores balance and vitality, stimulates collagen production. Optimal results are achieved after doing a series of treatments. derived stem cells and anti-aging peptides immediately leaving the skin younger looking and luminous. Treats pigmentation, photo damage and sun/dark spots, melasma. Light superficial flaking may occur with minimal downtime. Noticeable improvement after just one peel. Optimal results are achieved after doing a series of treatments. An anti-aging blend of Glycolic, Retinol and botanical lighteners in an Aloe Vera gel base to correct, repair and rejuvenate aging skin. Visibly reduces the appearance of fine lines and wrinkles. This powerful peel can take years off of aging skin. Fighting against the effects of time, sun damage and environmental impurities. Stimulates collagen production. Leaving the skin revitalized and firm. Light superficial flaking may occur with minimal downtime. Noticeable improvement after just one treatment. Optimal results are achieved after doing a series of treatments. Purifies and detoxifies oily skin. A powerful AHA/BHA, Salicylic acids and glycolic acids blend in an organic Aloe Vera gel base, fights acne lesions. Plant stem cells inhibit p. acnes bacteria, reduce blemishes, redness and botanical lighteners correct post break out dark spots. Noticeable improvement after just one peel. Optimal results are achieved after doing a series of treatments. This deep clarifying treatment refines and resurfaces by actively exfoliating the top layers of the stratum corneum, enabling it to penetrate, rid the pores of acne-causing build-up and help fade hyperpigmentation. Targeted for active acne or acne-prone skin, thicker, oily skin, and for resistant mature skin with enlarged pores. Dissolves Pore-clogging Debris; Reduces Acne Lesions and Inflammation; Fades Post-blemish Hyperpigmentation; Diminishes and Helps Prevent Scarring. This peel may involve some downtime. Noticeable improvement after just one peel. Optimal results are achieved after doing a series of treatments. A more advanced treatment. Rejuvenates and repairs. Powerful yet non-damaging. A power house blend of exfoliating agents lactic acid, resorcinol, retinol, vitamin C , are combined with arnica, green tea, powerful anti-oxidants, correcting peptides, plant derived stem cells and other synergistic nutrients and ingredients to create perfection when treating advanced pigmentation, acne and aging conditions. You will notice improvement in skin texture and tone revealing healthier skin. Peeling and flaking to be expected after 3 days. This treatment can provide noticeable results after just one peel. Optimal results are achieved after doing a series of treatments. This extremely popular professional-strength peel is for those who desire more aggressive resurfacing, lifting, smoothing and exfoliation. TCA generates an aggressive chemical exfoliation. The remarkable results — and a significant fading of unwanted pigment — make the following week of skin peeling well worth it. Reduces post-inflammatory hyperpigmentation, crow’s-feet, fine lines, wrinkles, enlarged pores, sagging necks, sun damage, melasma, superficial blemishes, post-acne scars. Evens out Pigment; Increases Hydration; Refines Texture; Uncovers Brightness, and helps stimulate reproductive collagen. Down time required, your Certified Aesthetician will discuss this with you in-depth at time of consultation. sun damage. The total regenerating effect delivers smooth, retextured skin not typically achievable with AHA or BHA fruit acid peels. Targeted for uneven texture, photo-damaged or hyperpigmented skin. Smoothes Lines and Wrinkles; Heals Acne Lesions and Ingrown Hairs (folliculitis); Reduces Acne Scarring; Evens out Pigment. Down time required, your Certified Aesthetician will discuss this with you in-depth at time of consultation. Achieve radiant, glowing skin with an enzyme or chemical peel. At Apeel Aesthetics, we have a variety of Peel options for all skin types and concerns, from mild (Enzyme) for a pre-event glow, to deeper peels (Chemical) for more serious skin issues. Our peels differentiate by levels of strength and healing time. Although the idea of chemical peels sometimes makes people cringe, it is important to realize how new scientific breakthroughs have altered the way these procedures work. Our Aestheticians are also Certified Peel Specialists and will consult with you to discuss the most beneficial peel for your skin.